When creating a new sculpture I’m constantly spinning the work around to best see it as a three-D object. 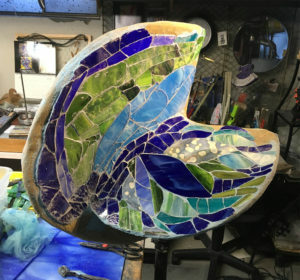 The surface design is also of concern and as the stained glass is cut to fit the curves as well as make a statement a name for the sculpture emerges too. For now the look of a fortune cookie is still in the forefront of my mind so ‘Fortune’ it is for the working title. Check back to see if the name has changed or suggest a title for me to use.